Memorizing the entire Multiplication Table can seem quite overwhelming at first. The key to learning about multiplication is to break the process down into manageable lessons. This is done through a series of rules or “tricks” that can be learned. Once these have been mastered, you will see that it is only necessary to memorize ten multiplication facts! First, however, there are several key concepts that must be understood. Sarah has 4 boxes of crayons. There are 3 crayons in each box. How many crayons does Sarah have altogether? 0’s: Anything times 0 equals 0 (0 x 2 = 0). 1’s: Anything times 1 equals itself (4 x 1 = 4). 2’s: Any number times 2 is doubled (4 x 2 = 8) / (4 + 4 = 8). 4’s: Any number times 4 is doubled once and then doubled again (6 x 2 = 24) / (6 + 6 = 12…12 + 12 = 24). 5’s: Use what you know about skip counting by 5 when multiplying by 5 (3 x 5 = 15) / (5, 10 15). 9’s: When multiplying by 9, use your addition and subtraction. Subtract one from the number you are multiplying. Then, think about the number you would add to it to equal 9. (4 x 9 = 36) / (4 -1 = 3…3 + 6 = 9). 10’s: Add a zero to any number that you multiply by 10. (6 x 10 = 60). 11’s: Think of 11 as two ones. Any number times 11 is that number times one and then that number times one again. (3 x 11 = 33) / (3 x 1 = 3…3 x 1 = 3). Only 10 Problems Are Left to Memorize! 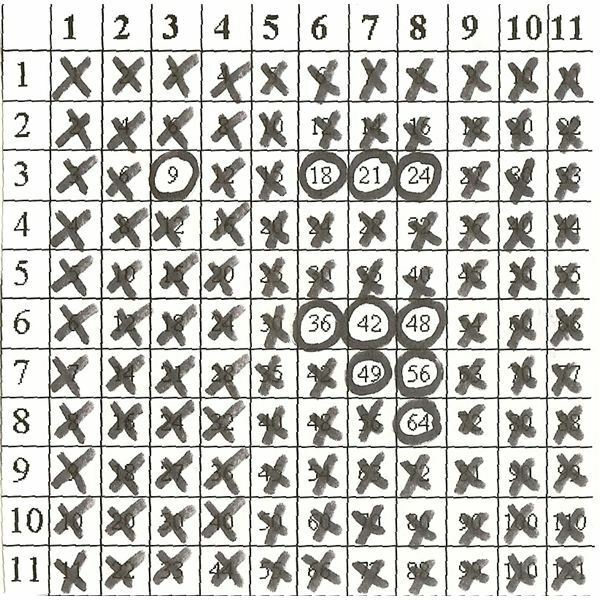 Unfortunately, some problems simply do no fit into the patterns found in the times table. These problems must be memorized. The good news is that once you incorporate the Commutative Property of Multiplication, you are left with 10 problems instead of 20! The circled problems in the Multiplication Table shown represent the 10 problems that you are best off memorizing. By employing these simple tips and tricks, you will quickly be on your way to learning your multiplication facts! Congratulations!